1917 - Hammond Manufacturing traces it's roots back to a small basement shop set-up during the years of the First World War by Oliver S. Hammond - tool & die maker by day and amateur inventor by night. (Yep...Fred's dad!!! For those who knew Fred - famous radio amateur VE3HC) The company became O.S. Hammond & Son and soon included sons Len, Roy, Ken and Fred. Later Oliver's first "shop" was a 20 by 30 foot facility behind the family home. The shop was powered by a boiler that burned just about anything. The steam from the boiler powered a small steam engine, which turned the main shaft and pulleys. Remember, there was no electricity service yet! Steam power, human power, light of day or lantern was a fact of life! 1920 - The company began to build early radio sets, just as the first radio stations began to spring to life one by one around the United States. 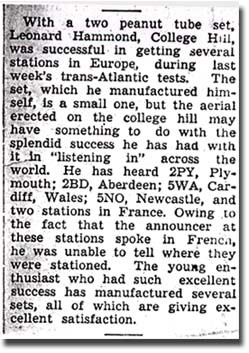 Starting out with a single tube radio (link here to a local 1923 Guelph, Ontario newspaper article) and progressing to 5 and finally 6 tube models in 1926. 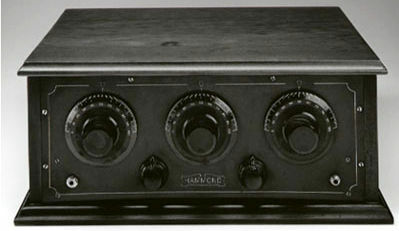 Below, one of only three known remaining Hammond "Model 12" 5 tube receivers (built between 1923 -1924). One unit is on display at the HAMMOND MUSEUM OF RADIO another is on display at the Edinburgh Rd (Guelph, Ontario) facility. 1925 - Oliver Hammond passes away - his sons Len, Roy, Ken & Fred take over the the company. 1927 - The company was incorporated as Hammond Manufacturing. 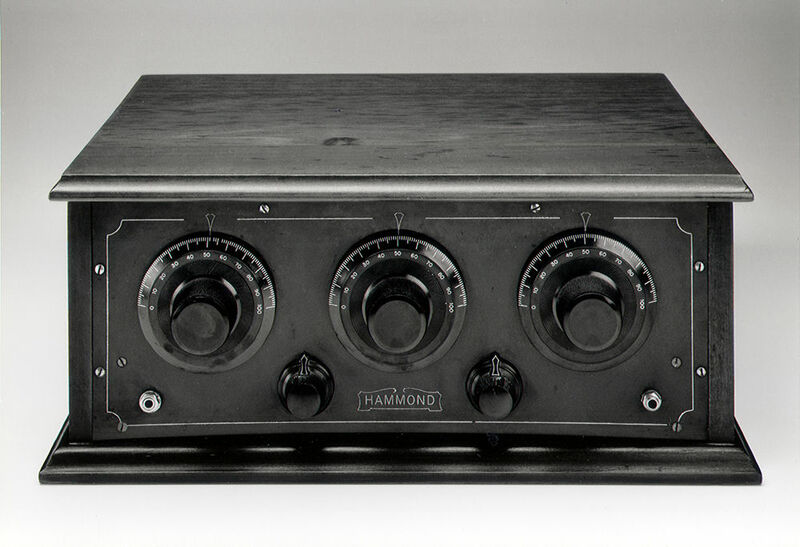 During this time, the Hammonds started to manufacture audio power amplifiers, radio battery chargers and battery eliminators which resulted in the production of transformers and metal cases for the first time. Link to pages covering these products from one of our early distributors, Aikenheads Radio Catalog (1929-1930) (PDF file - 934K). These products, more than 80 years later, represent the core of our business. Check out the "Classic" section of our site for more history on our audio, R.F. & current day products dating back to these roots. 1930's - The Company continued to grow in spite of the turbulent economic times, building a variety of transformers, racks and components for radio transmitters and audio amplifiers. 1940's - Our previous years experience put Hammond in the forefront of the manufacture of magnetic components during World War II for communication transmitters and very specialized transformers for radar. Events in Korea and the beginning of the Cold War once again thrust upon the Company significant volumes of military transformers, especially as a result of the construction of extensive early warning radar systems across Alaska, Canada and Greenland. 1960's - 1970's - The prosperous decades of the 60's and 70's saw the Company expand into an even broader range of specialized and catalog transformers and cabinetry for the electrical and electronic industries. It is during this time that the company expands into the U.S. and World markets. In 1978, Rob and Bill Hammond acquired control of the company and thereby ensured passage of the business into the third generation of the Hammond family. The Company was then re-organized into three separate profit centers for transformers, cabinetry and power supplies. A Corporate service group was also established for the sales, marketing and distribution of catalog products. 1986 - Hammond took another step in Corporate evolution by trading its shares on the Toronto Stock Exchange (TSX) - (Traded under the symbol HMM.A). 1996 - Hammond Manufacturing joins the World Wide Web! A user friendly, low bandwidth, specifier site is created. Our design theme continues to this day. 1999 - Sadly, both Fred Hammond (VE3HC) and his brother Roy Hammond passed away this year. In September the Hammond Museum of Radio was relocated to its new home in the expanded facility on Southgate Dr. in Guelph, Ontario, Canada. 2007 - Ken Hammond passed away this year. The last of the four sons from the the original O.S. Hammond & Son company (see 1917 notes - above). 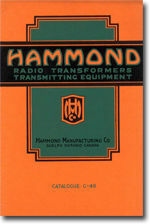 Since its modest beginnings in the basement of the family homestead 100 years ago, Hammond has now grown into two separate, medium-sized companies with combined annual sales in excess of $300 Million & thousands of employees located in facilities around North America, Europe and Australia. We see a future bright with promise and opportunity for both companies!